McMurray Musings: Where Hope Becomes Home - Second Annual "Hope in the Dark"
Where Hope Becomes Home - Second Annual "Hope in the Dark"
This morning I cried about homelessness. This happens to me on occasion, usually after a visit to a small building on Franklin Avenue, although today it was an article about a homeless man in the city where I grew up, and the impact his recent death has had on police officers there. I have been thinking a great deal about the homeless recently, and it is because of an event that is coming up very soon. Last year I spent a night sleeping on a park bench. I did it because I wanted to learn a bit more about how it feels to be homeless, and last year our local daytime drop-in shelter for the homeless hosted an event called "Hope in the Dark". That night has resonated with me ever since then, because it is a night I will never, ever forget. It was a night designed to raise awareness of homelessness and create understanding by allowing people to experience what it is like to be homeless for a night. There are moments burned into your mind. For me one of those is when last year, early in the morning, I lay in my sleeping bag on a park bench and realized I was cold, and very tired, and I felt very alone. I had barely slept at all, and I had heard strange noises all night. I had huddled inside an open doorway for warmth, and I had relied on my fellow "homeless for a night" friends. And I truly felt alone, and vulnerable, despite knowing I was surrounded by friends. And the funny thing is I knew I could go home and to my warm and comfortable bed after it was over. I didn't have to wander the streets all day until I slept outdoors on a bench - again. I could go home. Because I had a home to go to. Over the last two years I have become quite passionate about the homeless in our community. I have spent time at the Centre of Hope, where I believe hope truly is found for those who often see little hope in their lives. I have gotten to know the staff there, but more importantly I have gotten to know the patrons, and I have begun to care about them deeply. Every single one of them has a story, a reason they have ended up on the streets of our community. I have listened to those stories, and some...well, some simply break my heart. They are told with such honesty, and such courage. I would say, in fact, that their honesty and courage inspires me. They have encouraged me to be honest and courageous and to tell stories that would be very easy to not tell. I have learned through their honesty and courage to find my own. I have learned from them, you see. And last year I learned a little about how they must feel, sleeping on park benches and on the ground. I learned how it felt to be cold and tired and alone, and how you begin to rely heavily on those around you. I learned how much you need to hang onto to hope, because at 3 am, when it is dark and cold and there are scary noises and you feel alone you can very quickly lose sight of hope. 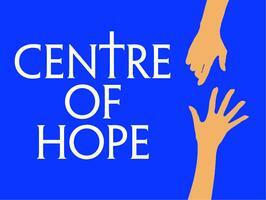 This year the Centre of Hope is hosting the second annual "Hope in the Dark" event. You can choose to sleep in a sleeping bag under the stars, or a cardboard box, or a tent. If you are me then you will head straight for the park bench you know, a bench that others have begun to call yours. And you will find yourself lying awake at 3 am, thinking about homelessness and the nature of hope. This year I am hoping many more people will join me in a little park in downtown Fort McMurray. I know the Centre of Hope has some activities - and some surprises - planned. I know that there will be a festive feeling in the air, almost a party atmosphere - but that as the night winds down and the darkness descends all the participants will begin their own journey of homelessness. It might sound like a cliché, but the event last year changed me. It was the kind of experience I find hard to explain in words, and one that still makes me feel a bit shaky on occasion when I recall certain moments of clarity about the experience of homelessness. This is what I know. There is a time, at about 3 am, when all is dark and you think all around you are asleep. You huddle deeper inside your sleeping bag, cold and afraid. You begin to think about your life, and about the stories of those who have shared their experience of homelessness with you. You begin to think about your own warm bed at home, and you begin to realize the line between you and those who sleep on park benches every night is a very fine one. You shiver a bit from the cold, and from fear. And then, if you are me, you cry a little bit when you think about those for whom this is not a choice, and not an "awareness event". You cry because your heart hurts when you think of them, and their stories, and their life - and, all too often, deaths - on the streets of our community. And then you wake up a couple of hours later and realize that the mittens you are wearing to protect your fragile hands from the cold are still damp with tears, and you go home. Because you have a home. And that realization makes you start to cry all over again when you realize that hope, in the end, might be all that some people have, because they do not have a home. One letter separates those two words - hoPe becomes hoMe. And maybe that is why we need to hold onto hope - so that some day hope will become a home for those who have neither. We cannot allow being homeless to become being hopeless. We have the power to change it, to turn hope into home, but first - very first - we must understand it. And this is your chance to do so. will be held on May 25th. and turn hope into home.